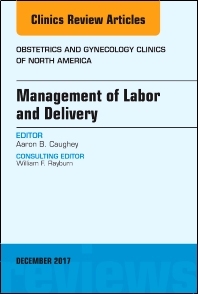 Preface: Evidence-Based Management of Labor and Delivery: What Do We Still Need to Know? Evidence-Based Labor and Delivery Management: Can We Safely Reduce the Cesarean Rate? Labor Induction Techniques: Which Is the Best? Elective Induction of Labor: What is the Impact? Vaginal Birth After Cesarean Trends: Which Way Is the Pendulum Swinging? Dr. Caughey has recruited top experts to address the current questions and thinking with regard to the management of labor and delivery. Authors have presented current clinical reviews on the following topics: Defining and managing normal and abnormal first stage of labor; Defining and managing normal and abnormal second stage of labor; Laborist models on labor and delivery; Quality Improvement on Labor and Delivery; Fetal Malposition; Is there a place for outpatient pre-induction cervical ripening; Management of twins on labor and delivery; Cervical ripening techniques: Which is the best; Augmentation of labor: What are the approaches; Elective induction of labor: What is the impact; VBAC trends: Which way is the pendulum swinging; and Update on fetal monitoring. Readers will come away with the current clinical trends and information they need to successfully manage labor and delivery.